I'm not usually fond of Dystopian novels - other than the usual suspects (Hunger Games, Divergent, Delirium series), I think I've only read a few. I guess it has something to do with the world-building (or lack thereof) - to elaborate, whether or not the worlds presented by the authors are the least bit believable. When I read dystopian novels, it's a plus when I actually I see this world being the one where we live in in a few decades or so - do you guys get what I mean? And for me to think that, at least some facets of the created world must be plausible. Also, I think you guys ought to know by now just how much I hate info-overload when it occurs during the first few chapters of a particular novel. Anyway, the point is simple, really - if the world-building is off, there's just no way I can like the dystopian novel in question. Given that I'm very picky when it comes to dystopians (is that even a word? ), you guys should believe me when I say that Article 5 is GOOD, and that you all should read it. 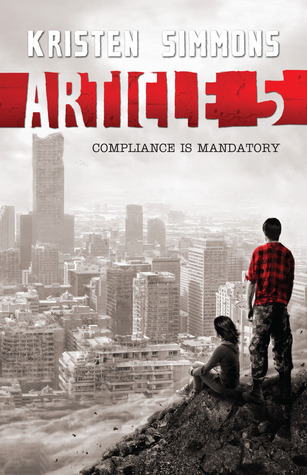 It usually takes me a LONG time to read dystopian novels (I usually can't stand reading them in one sitting because all the unnecessary details get on my nerves), but it took me only a few hours to read Article 5. And I finished it in one sitting, so there's that! I'm not going to say that Article 5 is without faults, but I found those faults easy to overlook, and I don't think they'll bother anyone too much. (I think most people's complaints center around the main character, but I'll get to that later.) My biggest gripe probably is the lack of a more detailed back story. While I had no problem when it comes to how believable and how realistic the word created is (I truly can envision our would being rather similar to the world depicted in Article 5 if wars and such became more prevalent) I would have appreciated a more broad and encompassing approach while painting just how this said world came to be - just how exactly did everything become so horrible? Just what prompted the Bill of Rights to be deemed null and void? What I liked the best about Article 5 is how fast-paced the plot is. There isn't any boring part in the novel - it's jaw-dropping action all the way, and I thoroughly enjoyed how I was on the edge of my seat while tearing through the pages as fast as humanely possible. I also enjoyed reading about the characters - yes, even Ember, our beloved MC. Truth be told, I loved how stubborn Ember was - I loved how she knew what she wanted, and that she was willing to do absolutely anything to get it. She wasn't easily derailed from her goals, and though she made illogical decision upon another, I can't help but admire her bravery to do the unthinkable. I don't think I have ever met a more determined character! It would have been so easy for her to do what she's told, but she's not easily distracted nor sidetracked from what she wants the most - to be reunited with her mother. Never once did I think that the romance in this novel was forced, or that it just suddenly blew up in my face with no warning whatsoever. It was always there - you knew it was going to make itself known in one way or another. I liked how Chase calmed Ember down and slowly earned back her trust; and I love how it took a while for Ember to trust Chase, because he was one of the soldiers who took away her mom, after all. It wasn't just blind love and adoration for these two - they were initially wary of each other, but that slowly goes away as they spent more time together and talked. The flashbacks also gave a lot of depth to Ember and Chase's relationship, and I particularly enjoyed reading those parts.